On Jan. 30, Maxar Technologies bowed out of a cost-sharing partnership with the U.S. Defense Advanced Research Projects Agency for developing and operating the Robotic Servicing of Geosynchronous Satellites (RSGS) mission. However, Maxar’s exit has a silver lining. During the next few months, DARPA will evaluate other options for RSGS and should seriously consider the use of RSGS spacecraft as bodyguards to defend our critical satellites. DARPA should also keep the current schedule of launching the first RSGS spacecraft in spring 2021. Last February, Air Force Secretary Heather Wilson said large satellites like Space Based Infrared System (SBIRS) are vulnerable to electronic and kinetic attacks, and smaller spacecraft would be more resilient. Under the 2019 budget Congress approved last fall, the Air Force is transferring the funding for SBIRS satellites 7 and 8 to the next-generation of missile warning satellites, as the Air Force is seeking a “survivable missile warning capability by the mid-2020s.” As the kinetic threats from peaceful robotic servicing spacecraft of China and Russia will be upon us by the early 2020s, the U.S. will have to rely on SBIRS satellites for a few years between early 2020s and mid-2020s, assuming the new, more survivable missile warning satellites arrive on schedule. If history is any guide, the more survivable satellites will likely be delayed, or only partially deployed by the mid-2020s — meaning the U.S. would have to rely on SBIRS satellites longer than a few years. In the deterrence of a nuclear apocalypse, early warning must be available without gaps in any time period, long or short. Currently, there are four SBIRS satellites at geosynchronous orbits, and, by the early 2020s, there will be two more for a total of six. Physics says a minimum of three geosynchronous satellites are required to watch the entire Earth, excluding polar regions. Therefore, if China or Russia can disable four SBIRS satellites in geosynchronous orbits, the U.S. would have a gap in early warning coverage. Such a gap would delay the military’s assessment whether a nuclear missile has been launched and which region it is expected to land. We need every second of warning to activate the threat warning and notification system for the targeted population and prepare for military responses to the nuclear attack. Can four satellites be disabled? There is currently no agreement to stop Chinese or Russian supposedly peaceful robotic spacecraft from sidling up to any number of our satellites and lurking at an arbitrarily close distance. As Secretary Wilson said, our SBIRS satellites are “vulnerable” to “kinetic attacks” including the grapple and crash by robotic arms. DARPA could use RSGS spacecraft serving as bodyguards to block off, or wrestle with, the robotic attackers. Also, it is always desirable to make a bodyguard as cheap as possible. Since the first four SBIRS satellite costed about $1.7 billion each, there is a lot of room to make a bodyguard far cheaper. 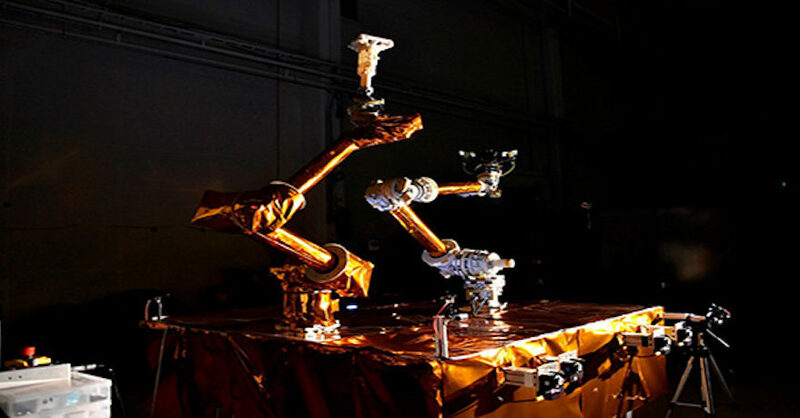 In order to keep the launch schedule of spring 2021, the first few bodyguard spacecraft can be identical to the RSGS robotic servicing spacecraft. However, DARPA should determine whether a RSGS spacecraft dedicated as a bodyguard can be designed and made substantially cheaper than a RSGS spacecraft for servicing other satellites. These cheaper bodyguards can be used as soon as they become available. By the way, these bodyguard spacecraft could also release decoys to confuse ground-based direct-ascent antisatellite missiles. In the deterrence and defense against nuclear attacks, the U.S. also needs to protect Advanced Extremely High Frequency (AEHF) communications geosynchronous satellites. The fourth one, costing $1.8 billion, was launched Oct. 17 to join three similar satellites in forming a global network for communications. Mike Cacheiro, Lockheed Martin’s vice president of protected communications and AEHF program manager, said that “It’s also the only system that survives through a near nuclear burst and can provide communications through scintillated environments that other communications system could not.” There are two more AEHF satellites planned for launch in 2019 and 2020. Similarly, disabling four AEHF satellites by an adversary would result in the loss of full coverage between 65 degrees north latitude to 65 degrees south. As to a follow-on to the AEHF constellation, Forecast International reported that “deliveries are expected to begin in the mid-2020s.” Thus, the AEHF satellites would have to be protected beyond mid-2020s until the follow-on constellation is fully launched and operational. Moreover, Maxar’s exit is a clear signal that the return on investment of the RSGS partnership as currently structured is poor. Therefore, procuring additional RSGS spacecraft as bodyguards and adding a project to reduce the cost of RSGS bodyguards would improve the profitability of the RSGS program and enhance the chance of getting another commercial partner who will not bow out later. DARPA has just completed 60 years of amazing achievements. Protecting SBIRS, AEHF, and other critical satellites would clearly meet the high standard of a DARPA project. Better yet, DARPA’s RSGS robotic servicing spacecraft is already well on its way to full development. It may well be the only program in the United States that can be built on what we have had so far and be ready in time to defend against the threats from supposedly peaceful robotic servicing spacecraft, which will be upon us by the early 2020s. DARPA should seize the silver lining of Maxar’s exit for another amazing achievement. Brian Chow is an independent policy analyst and author of over 150 publications. His recent space-related articles appear in Strategic Studies Quarterly, SpaceNews, The National Interest, Defense One, Defense News and The Space Review. He can be reached at brianchow.sp@gmail.com.